The Cathedral of Saint John the Divine is becoming even more heavenly for the foodie crowd. 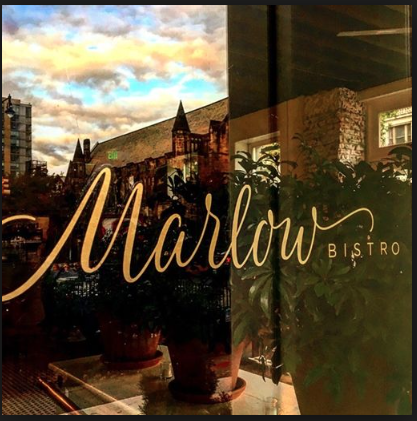 Marlow Bistro, a farm-to-table Mediterranean eatery, has recently opened across the street at 1018 Amsterdam Ave. and just received outdoor patio approval for 20 seats. That’s in addition to the classic Hungarian Pastry Shop, a stalwart of the neighborhood, at 1030 Amsterdam. Marlow’s 1,500-square-foot space seats 40 people in the dining room and another 20 at the bar. Owners Dragan Ristovski and Marjanne Motamedi hope the eatery will become a local hotspot, like their popular Cibo e Vino space on W. 89th St. and Broadway. Marlow’s executive chef, Belgrade-born Zivko Radojcic, got his start with top chef Terrance Brennan at now-defunct Picholine. Dinner is seven days a week, with weekly lunch and brunch on weekends. The decor features classic exposed brick, an original wood beamed ceiling and lots of greenery. There’s also the farm chicken duo — chicken breast roulade and stuffed chicken legs stuffed with brown butter chicken mousse, sous vide and served with parsnip puree, wild mushrooms, brown butter Bearnaise and brown butter crumbs.